The volleyball team fell to 4-19 on the season and 1-8 in the Atlantic Ten. With only a month left in the season, back-to-back shutouts against Saint Louis and Duquesne dashed all hopes for the volleyball team to salvage a respectable record. The match against the Dukes on Saturday in McGonigle Hall marked the team’s sixth straight loss, leaving the team with a 4-19 record overall and 1-8 in the Atlantic Ten Conference. The Owls opened the weekend Friday as they hosted the Billikens, a potential A-10 contender, and fell in straight sets. With 11 kills and 14 digs, senior outside hitter Megan Boken and junior outside hitter Alyssa Deno, who had 15 kills and 13 digs, led the Billikens with a double-double each. Freshman setter Hannah Kvitle dished out a match-high 34 assists and an ace to lead the team with a .185 hitting percentage. The Owls offense showed some balance as junior setter Rikia Trischuk provided 28 assists, while freshman outside hitters Elyse Burkert and Gabriella Matautia knocked down eight kills each. Senior libero Ariel Pierre continued to dominate on defense with a match-high 21 digs. The play of the team’s outside hitters has been one of the few bright spots during the losing streak, but coach Bob Bertucci said he doesn’t believe it’s enough. Part of the problem has been Trischuk’s learn-on-the-fly play this season. The junior stepped in to the setter role with no previous starting experience and needed time to adjust. One of her biggest weaknesses has been connecting with senior middle hitter Jessica Antosz this season. “It’s taken us a long time to get our setter used to going to the middle. It’s a timing thing,” Bertucci said. The Owls returned to McGonigle Hall Saturday to host the Dukes and showed some signs of improvement in the first set, barely losing, 25-22. But the first set was the team’s best opportunity of the night. The lead in the first set changed hands five times, compared to only twice in the final two sets. 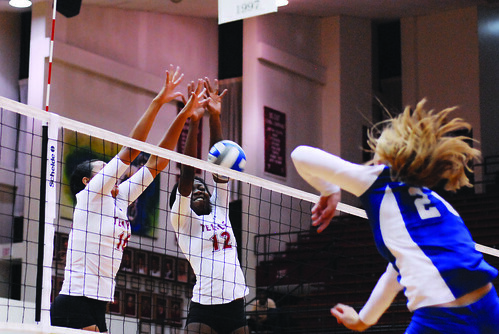 The Owls were led by senior outside hitter Ashley Carr’s nine kills on a .240 attack percentage. Pierre again led the team with a match-high 17 digs and also opened up the first set with consecutive aces, her only two of the night. That production couldn’t match the output on the Dukes’ side. Junior setter Sarah Svorinic provided a match-high 35 aces as three Duquesne hitters reach double-digit kills during the match. The combination of freshman outside hitter Allison Foschia’s 11 kills, 14 digs and two aces with sophomore outside hitter Sara Scheirman’s 14 kills and 11 digs gave the Dukes a lethal attack that confused the Owls throughout the match. Bertucci also complimented the Duquesne duo after the match. Six matches remain for the Owls this season, including five A-10 contests, beginning with a match against Charlotte at home Oct. 31. The team hopes to finish the season strong, Pierre said, against some of the conference’s weaker opponents, including a match against La Salle and home games against Fordham and Rhode Island. Jake Adams can be reached at jake.adams@temple.edu. Freshmen have proved themselves to be assets to the team. The Owls started the season strong, but struggled late.